what is dental plaque or Biofilm? Dental plaque or biofilm are basically the soft sticky deposits on your teeth. Dental plaque can be formed below as well as above the gum, based on its location on the tooth. This fact is important because it will make you aware to brush under your gums as much as you can. Supragingival plaque is found at or above the gum and it can be easily seen; while Subgingival plaque is found below the gum and it is not easily visible. Dental plaque is composed primarily of microorganisms (Bacteria & Fungi, a small number of viruses). Besides it also contains organic and inorganic materials derived from food deposits, saliva, and bacterial products. The inorganic constituents (Minerals) of plaque are predominately calcium and phosphorus, and their source is primarily saliva; as the mineral content increases, the soft plaque becomes calcified to form Tartar which is hard. While Plaque is soft and can be removed by daily oral hygiene; removal of tartar however needs special instruments, and help from dental professionals. Why is it important to recognize the role of Plaque in oral disease? 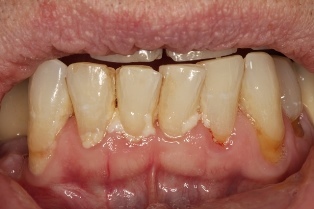 Gingivitis and most forms of periodontitis are the result of bacterial plaque. Beside that, bacteria in plaque are producing acid that softens enamel causing cavities. Prevention of bacterial plaque formation by daily cleaning and regular dental visits are predictable ways to prevent periodontal diseases. Healthy people (disease free) should have dental prophylaxis every 6 months. For high risk people, more frequent visits are necessary, ranging fro om 3-4 times a year. High risk group include but not limited to people with history of gum disease, pregnant women, smokers, people with systemic uncontrolled disease e.g. diabetes. Brush twice daily for at least 2-3 minutes. Floss at least once a day, after brushing, or If you can every time you eat. Use an anti-septic mouth rinse after your brush. Do not smoke. Smoking is the single most important risk factor for gum disease. Visit your dentist regularly for prophylaxis and check ups.